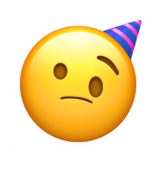 Courtesy of Boing Boing, we are having far too much fun with this custom emoji-builder that allows one to mix elements from different glyphs into something new and with a degree of specificity that might be otherwise lacking. We’re especially enthralled with the randomised feature that generates expressive chimera that rather defy a straightforward definition. What occasions would the pictured suit? Give it a try and show us what you come up with.